So sometimes I will wear my polish for a little under half a day and then take it off. I mean what is up with that? I like to think that I experiment with different polishes so I can try something new. But sometimes a combination just doesn't work wtf. I loved this combination of glitter with the blue, but unfortunately, it was not meant to be, because the nail polish peeled off easier fml. Same glitter polish, but a little better, because this time it didn't peel! I loved this whole gradient polish thing! I loved it so much, I tried to replicate it with the silver polish, but it was a fail. By the way in case you were wondering the Silver polish is a limited edition of OPI's collection called Spark De Triomphe. I believe the second coat of polish on the gold nails is a limited edition Rimmel London polish called Eccentricity. I don't think you can find these two in stores, anymore, but I'm pretty sure there are polishes that are super close to these ones. What is your favorite nail polish combo? I love that nail combo! 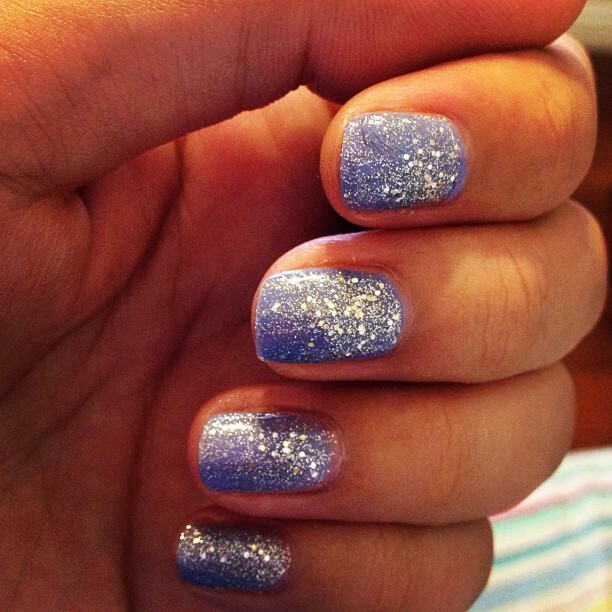 I love ombre glitter nails too! I was inspired by another girl's blog and then I decided to try it out. the blue looks so pretty!! How pretty, I love glitter! I love glitter as well. It's like a good topcoat for when I'm feeling lazy. Haha. i saw your other blog post as well with those earrings? GOEGEOUS!